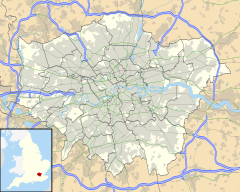 This article is about the area of London. For other uses, see Kings Cross. "Battlebridge" redirects here. For the Irish village, see Battlebridge, County Roscommon. For the Essex village, see Battlesbridge. The area has been regenerated since the mid-1990s with the terminus of the Eurostar rail service at St Pancras International opening in 2007 and the rebuilding of King's Cross station, a major redevelopment in the north of the area. The area was previously a village known as Battle Bridge or Battlebridge which was an ancient crossing of the River Fleet. The original name of the bridge was Broad Ford Bridge. The corruption "Battle Bridge" led to a tradition that this was the site of a major battle in AD 60 or 61 between the Romans and the Iceni tribe led by Boudica (also known as Boudicea). The tradition claims support from the writing of Publius Cornelius Tacitus, an ancient Roman historian, who described the place of action between the Romans and Boadicea (Annals 14.31), but without specifying where it was; Thornbury addresses the pros and cons of the identification. Lewis Spence's 1937 book Boadicea – warrior queen of the Britons includes a map showing the supposed positions of the opposing armies. The suggestion that Boudica is buried beneath platform 9 or 10 at King's Cross station seems to have arisen as urban folklore since the end of World War II. The area had been settled in Roman times, and a camp here known as The Brill was erroneously attributed to Julius Caesar, who never visited Londinium. There is still a small area named "Battle Bridge Place" between King's Cross and St Pancras stations, and "Brill Place", a road leading towards Euston from St Pancras Station. An art installation named the Identified Flying Object (IFO) stands in Battle Bridge Place, part of the RELAY King's Cross Arts programme. St Pancras Old Church, also set behind the stations, is said to be one of the oldest Christian sites in Britain. The current name has its origin in a monument to King George IV which stood from 1830 to 1845 at "the king's crossroads" where New Road (later Euston Road), Gray's Inn Road, and Pentonville Road met. The monument was sixty feet high and topped by an eleven-foot-high statue of the king; it was described by Walter Thornbury as "a ridiculous octagonal structure crowned by an absurd statue". The statue itself, which cost no more than £25, was constructed of bricks and mortar, and finished in a manner that gave it the appearance of stone "at least to the eyes of common spectators". The architect was Stephen Geary, who exhibited a model of "the Kings Cross" at the Royal Academy in 1830. The upper storey was used as a camera obscura while the base housed first a police station, and later a public house. The unpopular building was demolished in 1845, though the area kept the name of Kings Cross. A structure in the form of a lighthouse was built on top of a building almost on the site about 30 years later. Known locally as the "Lighthouse Building", the structure was popularly thought to be an advertisement for Netten's Oyster Bar on the ground floor, but this seems not to be true. It is a grade II listed building. King's Cross station now stands by the junction where the monument stood and took its name. The station, designed by architect Lewis Cubitt and opened in 1852, succeeded a temporary earlier station, erected north of the canal in time for the Great Exhibition of 1851. St Pancras railway station, built by the Midland Railway, lies immediately to the west. They both had extensive land ("the railway lands") to house their associated facilities for handling general goods and specialist commodities such as fish, coal, potatoes and grain. The passenger stations on Euston Road far outweighed in public attention the economically more important goods traffic to the north. King's Cross and St Pancras stations, and indeed all London railway stations, made an important contribution to the capital's economy. Model showing the current redevelopment of the King's Cross area with the new High Speed 1 terminal behind the barrel vaulted St Pancras station on the left. After World War II the area declined from being a poor but busy industrial and distribution services district to a partially abandoned post-industrial district. By the 1980s it was notorious for prostitution and drug abuse. This reputation impeded attempts to revive the area, utilising the large amount of land available following the decline of the railway goods yard to the north of the station and the many other vacant premises in the area. Relatively cheap rents and a central London location made the area attractive to artists and designers and both Antony Gormley and Thomas Heatherwick established studios in the area. In late 1980s, a group of musicians, mechanics, and squatters from Hammersmith called Mutoid Waste Company moved into Battlebridge Road warehouse. They built huge industrial sculptures out of scrap metal and held raves. In 1989 they were evicted by police. In 1992, the Community Creation Trust took over the disused coach repair depot and built it into the largest Ecology Centre in Europe with ecohousing for homeless youngsters, The Last Platform Cafe, London Ecology Centre (after its demise in Covent Garden), offices and workshops, gardens and ponds. It was destroyed to make a car park for the Channel Tunnel Regeneration. Bagley's Warehouse was a nightclub venue in the 1990s warehouse rave scene on the site of Goods Yard behind King's Cross stations, now part of the redevelopment area known as the Coal Drops adjacent to Granary Square. The site is one of the largest construction projects in Greater London in the first quarter of the 21st century. All of the "socially undesirable" behaviour has moved on, and new projects such as offices and housing are over halfway completed. In the 1990s, the government established the King's Cross Partnership to fund regeneration projects, and the commencement of work on High Speed 1 in 2000 provided a major impetus for other projects. In 2001, Argent was selected as the development partner. The London terminus of the Eurostar international rail services to Paris and Brussels moved to St Pancras station in November 2007. Following the opening of the High Speed 1 to the station, redevelopment of the land between the two major stations and the old King's Cross railway lands to the rear commenced. In 2008, Argent, London & Continental Railways and DHL formed a joint partnership: Kings Cross Central Limited Partnership. Outline planning permission, prepared by Allies and Morrison and Porphyrios Associates, was granted for the whole site in 2006. Detailed planning applications for each part of the site are being made on a rolling programme basis. The area remains a major focus of redevelopment in the second decade of the 21st century. In 2017, Google, which already occupy a large new building between St. Pancras and King's Cross stations, announced plans for a further £1 billion building stretching along the west side of King's Cross station towards the Regents canal. The area has also been for many years home to a number of trades union head offices (including the NUJ, RMT, UNISON, NUT, Community and UCU). King’s Cross in numbers: 67 acres, 50 new buildings, 1,900 new homes, 20 new streets, 10 new public parks and squares, 26 acres of open space, 30,000 people by 2016. The area has increasingly become home to cultural establishments. The London Canal Museum opened in 1992, and in 1997 a new home for the British Library opened next to St Pancras Station. There was a small theatre, the Courtyard, that closed in late 2006 as a result of the gentrification of the area caused by a number of regeneration projects there, in this case, Regent's Quarter, across the boundary in Islington. The Gagosian Gallery moved their main London premises to the area in 2004. 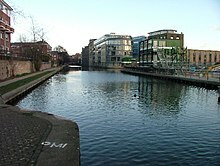 The London Sinfonietta and the Orchestra of the Age of Enlightenment are based in King's Place, on Battlebridge Basin next to the Regent's Canal. King's Place is also the home of The Guardian and The Observer newspapers, and of the UK Drug Policy Commission. In September 2011 the University of the Arts London moved to the Granary Complex. A whole series of new public squares and gardens have opened, among them Granary Square with its spectacular fountains, Lewis Cubitt Park and Square and the new Gasholder Park. The station's redevelopment led to the demolition of several buildings, including the Gasworks. In the Harry Potter books, King's Cross station is where the protagonist boards the train for Hogwarts. However, the author, JK Rowling, later admitted she mixed up Kings Cross with the next door station, Euston. The railway station has put up a sign for the fictional "Platform ​9 3⁄4" described in the books, and embedded part of a luggage trolley halfway into the wall. Film adaptations have used platforms 4 and 5 for some scenes. Kings Cross and its surrounding streets were also the setting for the 1955 Ealing comedy, The Ladykillers, two British drama films starring Max Bygraves—A Cry from the Streets (1958) and Spare the Rod (1961)—as well as Mike Leigh's High Hopes (1988). Anthony Minghella's 2006 film Breaking and Entering is also set in Kings Cross. "Vale Royal", an epic poem in 700 triads by Aidan Andrew Dun probes into this zone of London; "Vale Royal" was launched at the Albert Hall in 1995. A triad of Dun's, excerpted from another poem, "The Brill", has been installed at the western end of Granary Square in a small grove of trees beside the new Central Saint Martins. It reads: "Kings Cross, dense with angels and histories, there are cities beneath your pavements, cities behind your skies. Let me see!" The Irish rock group The Pogues was founded in Kings Cross. The British pop music duo Pet Shop Boys recorded a song featured on their 1987 album Actually named "Kings Cross": the melancholy track discusses the hopelessness of the AIDS epidemic during that time and uses the Kings Cross area as the "backdrop" of the story, trading on the area's associations with drug use and prostitution. Tracey Thorn covered the song in 2007. Songwriter David Gedge also wrote a song called "Kings Cross" while recording under the name Cinerama. King's Cross and St Pancras railway stations are the principal National Rail services in the district. St Pancras is the Eurostar terminus for international services to Amsterdam, Brussels and Paris. Thameslink train line run underground northwards towards Kentish Town and Finsbury Park and southwards towards Farringdon (connection with Elisabeth Crossrail line) and Blackfriars. King's Cross St Pancras tube station is a London Underground station underground in front of King's Cross railway station served by three sub surface lines sharing the same two platforms and three deep underground lines. Euston station, half a mile to the west, will from 2026/27 be the Central London terminus for the High Speed 2 trainline towards Old Oak Common and Birmingham, and from the early 2030s towards Manchester, Sheffield and Leeds. The One Belt One Road Initiative may one day allow high speed passenger trains to reach Europe from China. The exact routes has not been determined. ^ "King's Cross - 2011". UK Census Data. 2012. Retrieved 1 September 2017. ^ "Kings Cross is made up of the Kings Cross ward in the London Borough of Camden and 7 Output Areas in the Caledonian ward in the London Borough of Islington". Ukcensusdata.com. Retrieved 29 September 2016. ^ Highbury, Upper Holloway and King's Cross, Old and New London: Volume 2 (1878), pp. 273–279. Retrieved 15 May 2009. ^ a b c Walter Thornbury (1878). "Highbury, Upper Holloway and King's Cross". Old and New London: Volume 2. British History Online. pp. 273–279. Retrieved 11 November 2010. ^ Caesar's Camp at Pancras called the Brill (British Library). Bl.uk (30 November 2003). Retrieved on 30 July 2013. ^ "IFO (Identified Flying Object) by Jaques Rival at King's Cross". 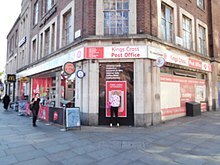 www.kingscross.co.uk. Retrieved 1 September 2017. ^ "The art programme at King's Cross". www.kingscross.co.uk. Retrieved 1 September 2017. ^ a b Mills, A. D. (2001). A dictionary of London place names. Oxford: Oxford University Press. ISBN 0192801066. ^ Algernon Graves (1905). The Royal Academy: A Complete Dictionary of Contributors from its Foundations in 1769 to 1904. 4. London: Henry Graves. p. 220. ^ Greater London Industrial Archaeology Society newsletter, February 2000. Glias.org.uk (27 December 1999). Retrieved on 30 July 2013. ^ Listed building details, Camden Council Archived 14 May 2012 at the Wayback Machine. Mycamden.camden.gov.uk. Retrieved on 30 July 2013. ^ a b Moore, Rowan (12 October 2014). "All hail the new King's Cross – but can other developers repeat the trick?" – via The Guardian. ^ "History « Mutate Britain". Mutatebritain.com. 4 August 2010. Retrieved 29 September 2016. ^ Mutoid Must Remain (21 February 2014). "Mutoid Must Remain". Meeting Benches. Retrieved 29 September 2016. ^ "King's Cross Development Forum". Kxdf.wordpress.com. Retrieved 29 September 2016. ^ "The Regents Canal History". Canalmuseum.org.uk. Retrieved 29 September 2016. ^ "About Larry Gagosian - Gagosian". Gagosian.com. Retrieved 29 September 2016. ^ Built in the 1860s and rebuilt in the 1880s, the gasholders (of unique linked triplet design) were still in use until 1999. Several gasholders (the site was originally a gasworks) that had dominated the area behind station for over a century have been taken down during the building works and placed in storage, and three are re-erected and converted to other use, partly a park, partly housing. ^ "Harry Potter's London". Visit London. Retrieved 21 July 2017. ^ Shoard, Catherine (7 December 2011). "My Favourite Film: The Ladykillers". My Favourite Film (story series). The Guardian. London. Retrieved 21 July 2017. ^ "King's Cross Stars in Minghella's Homage to London". Film London. 28 November 2006. Retrieved 21 July 2017. ^ Jelbert, Steve (28 April 2012). "Here Comes Everybody: The Story of The Pogues, By James Fearnley". The Independent. London. Retrieved 21 July 2017. ^ "China Planning to Connect High Speed Rail Lines To Europe". 15 March 2010. Retrieved 3 November 2016. ^ "Official site". House of Illustration. Retrieved 6 November 2015. ^ "Gasholder Park London | Nearby hotels, shops and restaurants". LondonTown.com. 16 December 2014. Retrieved 29 September 2016. Wikimedia Commons has media related to Kings Cross.